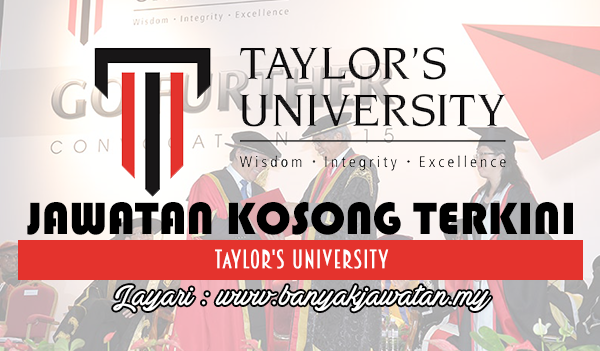 TAYLOR'S UNIVERSITY is a leading international university amongst the top 10 Malaysian universities. With an unparalleled reputation for outstanding experience provided to its students, Taylor’s University is pioneering an approach to university education which aims to develop the intellectual, physical and emotional capability of its students and make them the first choice for employers of graduates. The University plans to build on its strength to move into the league of top 100 Asian universities. Since its inception in 1969, Taylor's has become one of Malaysia's most successful and reputable private high education institutions. Taylor's has continuously provided excellent services for its students in terms of diverse study options, relevant curriculum and teaching methods, ongoing partnerships with leading universities worldwide, strong industry linkages, up-to-date facilities and well-equiped campuses. 0 Response to "Jawatan Kosong di Taylor's University - 4 March 2018"